The Pines Resource Recovery Park is the Selwyn District's waste handling facility. Located near Rolleston, the facility accepts a range of recyclable materials, household hazardous waste, cleanfill, food and garden waste for composting, as well as general waste for items that are currently unable to be recycled. Selwyn District does not have its own landfill so all residual waste is sent to the Kate Valley Regional Landfill in the Hurunui District. (between Dunns Crossing and Burnham Roads). 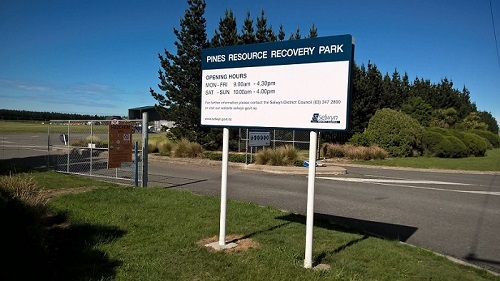 The Pines Resource Recovery Park is closed on Good Friday, Christmas Day and New Year’s Day, and reduced hours on ANZAC Day (1pm to 4.30pm). Please note that the Recovery Park may be closed from time to time without prior notice during high wind events. We are only able to accept payment by Eftpos and cash. Credit cards and cheques cannot be accepted for payment at the Pines Resource Recovery Park.